CDC: Resistant Candida auris is a ‘Serious Global Health Threat’; Is Your State Getting Hit? In response to mounting cases across the globe, this week the Centers for Disease Control and Prevention called Candida auris an “emerging fungus” that poses a “serious global threat.” It spreads in healthcare settings via contact with exposed surfaces and person-to-person contact. It’s also resistant to some or all antifungal drugs, according to the CDC, making it an especially vexing concern. The most common symptoms include chills and fever that do not respond to antibiotic treatment for the presumed cause. Diagnosis is by culture. 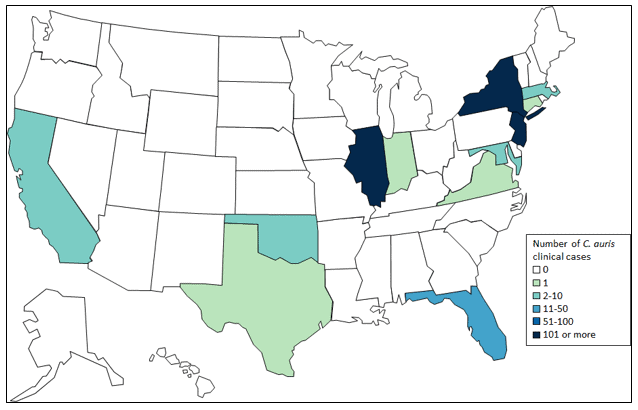 Cases have been confirmed in 12 U.S. states with no discernable pattern—literally coast to coast and from the southernmost points on the map to the Canadian border (Figure 1). New York has the most cases (309), followed by Illinois (144) and New Jersey (104). Urgent care clinicians should be vigilant in patients who complain of fever and chills not attributable to an identified source, especially those who have recently been discharged from a healthcare facility. Confirmed cases should be reported to local and state health departments.